The quote has been the siren song of anti-war protesters and, most recently, the banner for mass online protests against the NSA’s surveillance program. 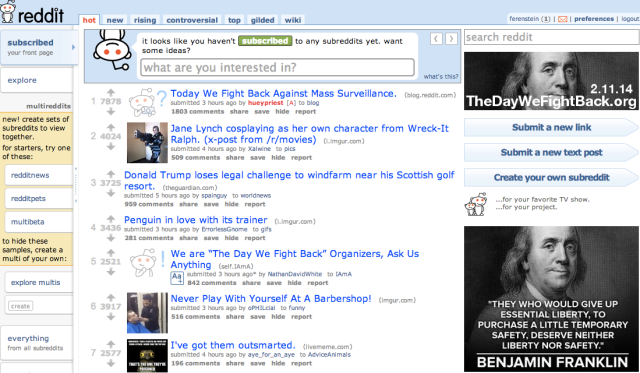 For instance, here was Reddit’s front page two days ago, when it officially joined the fight against Internet and phone spying. Indeed, if you look at the text surrounding the famous quote, it’s pretty clearly about money: “Our assemblies have of late had so many supply bill, and of such different kinds, rejected, on various pretences,” wrote Franklin. There’s not much on liberty, as we understand the concept, in the entire letter. How Did It Get Butchered? To Google Ngram! Thanks to the magic of Google’s Ngram viewer, we can get a historical peek at how it got molded for PR purposes. Google’s Ngram scans historical texts and lets users see how words change over time. As we can see from the two chart above, Franklin’s quote didn’t mean much for 150 years after it was uttered, then had a solid and steady uptick around the later half of the 20th century, when fear of big brother began to mount (the top chart represents the frequency of the quote in books from 1750-present, the bottom from 1950-present). In the few 19th-century books the quote does appear in, it doesn’t appear to be taken out of context, such as in the 1865 epic retelling of “The Life Of Joseph Warren,” where it is quoted in full with delicious servings of context. It wasn’t until the turn of the century did the butchering for ideological purposes begin. For instance, it was taken out of context in a book that is one of the closest things libertarians have to a bible, Frederick Hyak’s Road To Serfdom (1944), where Franklin’s quote concludes a chapter on the magnificence of the free market. The banner anti-security quotes continue throughout the century in government reports on limited government and early apocalyptic warnings about the security state. Misquoting folks isn’t new. It arises from the need to push an idea rather than investigate truth; it’s no shocker, then, that campaigns and ideological works have been the culprits of butchering Franklin’s words.